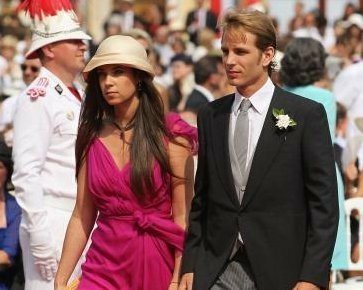 Princess Caroline of Monaco has announced the engagement of her eldest son and second in line to the throne of the principality, Andrea Casiraghi, to the Swiss born heiress and socialite Tatiana Santo Domingo. Tatiana Santo Domingo is the daughter of the late Julio Santo Domingo, named by Forbes in 2011 as the second richest man in Colombia, and Vera Rechulski , a former Brazilian socialite from Sao Paolo currently living in Paris. In a statement yesterday, Princess Caroline declared that she “had the joy” to announce the engagement of Andrea Casiraghi and Tatiana Santo Domingo, who are both 28. They have known each other for seven years and met whilst studying at the same school in Paris. No date has been fixed for the royal wedding but it is understood it will take place next year. Andrea Casiraghi, the grandson of Grace Kelly is the son of the late Stefano Casiraghi, the second husband of Caroline, who died in a boating accident off Monte Carlo in 1990. Last December Andrea Casiraghi was stopped by Police for speeding at 170 mph. His Audi 6 was immobilized, his driving license seized and he had to return to Paris by train. In February this year his younger brother Pierre, 24, allegedly got into a fight with a stranger at an exclusive New York nightclub because he was “jealous” of him. Pierre Casiraghi was punched and sent flying into a table on the other side of the room, landing with blood pouring from his face. French media have dubbed elder brother Andrea Casiraghi as an “enfant terrible” and the “angel rebel”. In 1999 Andrea Casiraghi was included on the 50 most beautiful people list. Four years later, he was voted the most stylish royal man by readers of Hello magazine, and in 2008, Forbes placed him tenth on its 20 Hottest Young Royals list. In 2011, Tatiana Santo Domingo launched the Muzungu Sisters fashion venture in partnership with Dana Alikhani. Both Tatiana and Lauren Santo Domingo, the 36-year-old co-founder of ModaOperandi, a Vogue contributing editor and married to Tatiana’s half-uncle, are prominent socialites in New York. Tatiana Santo Domingo is internationally known for her unique fashion sense, said to vary from the elegant to the vintage and boho chic. She has cited Loulou de la Falaise as her style guru. Tatiana Santo Domingo was included in 2010 on the international best dressed list.